Few automotive battles raged as fiercely as the “Ponycar Wars” of the 1960s. Ford’s Mustang launched a new market for personal sporty cars in 1964, forcing GM to react with their Chevrolet Camaro in 1967. These two competed head-to-head in showrooms, stoplight match ups, at drag strips, and on road courses. And while the 35-year battle ended when GM retired the Camaro in 2002, the skirmishes these two competitors fought decades before still reverberate today. The most intense of these battles were conducted on the road courses of America and Canada in the Sports Car Club of America’s Trans-Am series. Introduced in 1966, the Trans-Am was open to four-passenger production cars in two classes – 2.0 liter and under and 2.0 liter to 5.0 liter. Ford commissioned Carroll Shelby to prepare a team of Mustangs for the first season’s competition which was against Dodge Darts and Plymouth Barracudas in the over 2.0 liter class. To everyone’s satisfaction, the new Trans-Am series captured more than a passing interest with both race fans and the automotive press – an impressive achievement for a first year race series. Watching with keen interest from the sidelines was Chevrolet’s Vince Piggins, one of the driving forces behind Chevrolet’s high performance program. Before the first production 1967 Camaro was built at GM’s Norwood, Ohio, assembly plant, Piggins had already conspired with the SCCA to bring Chevrolet into the Trans-Am series and developed a special package for homologation. Piggins’ first challenge was to homologate an engine that came in under the Trans-Am displacement limit of 5.0 liters (305 cubic inches). Chevrolet offered 283 and a 327 cubic inch engines, but nothing in between. The 283 wasn’t stout enough and the 327 was too large, but Piggins deduced that mating the four-inch bore of the 327 with the three-inch stroke of the 283 provided an ideal swept volume of 302.4 cubic inches. This was a tried and true combination that racers had used before, and it met the SCCA’s legal 305 cubic inch ceiling. It also meant that the 302 would inherit the intrinsic benefits of having a short stroke with an oversquare bore. A short-stroke engine can run at higher rpms for longer periods since there is less piston speed. That of course is what a race engine has to do – run for sustained durations at high rpms. The small-journal, cast iron block for the 302 was also shared with the 327 and the 350 engines in 1967. The crankshafts were forged steel and tuftrided for high rpm durability. The rods were shot peened and mated to 11.0:1 domed aluminum pistons with notched valve reliefs. The iron heads featured big 2.02-inch intake and 1.60-inch exhaust valves with wide passages and generous ports to produce mid and high-end horsepower response. The 302’s “30/30” camshaft was lifted from the 375-horsepower Corvette 327 fuelie engine and designed for use with solid lifters. A big 800-cfm, dual-pumper Holley carburetor was bolted to a tuned-runner, dual plane aluminum intake manifold, with the front crossover tapped for a temperature sensor. Log-style iron exhaust manifolds were standard but headers were on the option list. A single point Delco-Remy ignition was also standard with a transistorized ignition on the list of optional equipment. Piggins and Chevrolet blatantly “underrated” the 302’s horsepower at just 290 and torque at an equally absurd 290 lbs.-ft. In reality, the production engines generated over 375 horsepower, with power coming on strong from 3500 to 6500 revs and still pulling at 7000rpm. The concept of using “off the shelf components” to build both a spirited performance street engine and a wicked race engine had another advantage. Piggins could come to market with a production version of the engine at a significant cost savings and that would make it easier to sell the program to Chevrolet management. The rest of the package consisted of a heavy duty radiator, quick steering, 15×6 wheels on 7.35 x 15 nylon red stripe tires, four-speed Muncie M21 close ratio manual transmission, special springs and shocks, 3.73:1 rear axle and special wide stripes on the hood and rear deck lid. Mandatory options included power brakes with front discs and metallic rear drums. Chevrolet Product Planning assigned it the next available RPO package number on the list – Z28. The RPO number was just catchy enough to become the model name for Chevrolet’s new Trans-Am contender. 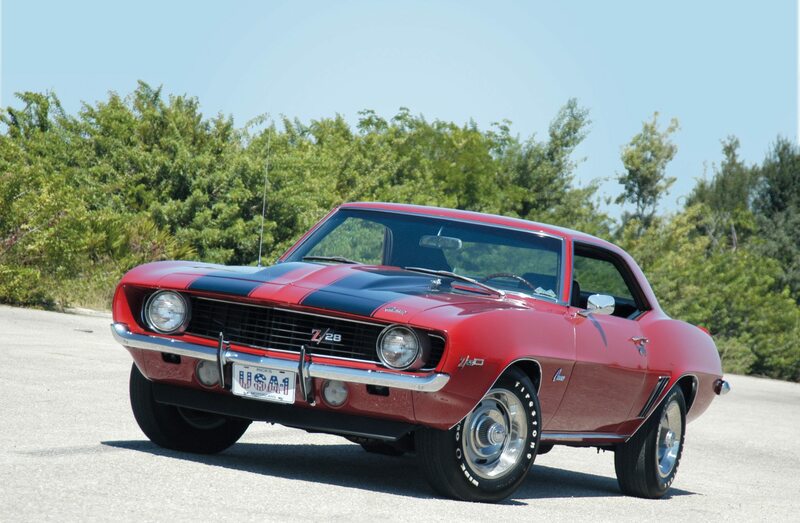 The Z28 was released on December 29, 1966, just in time to run in the 1967 Trans-Am series. Its public introduction was low key, and many Camaro buyers who didn’t see the magazine coverage of the Z28 weren’t aware it was available. Oddly enough, the Z28 got lost in the overall onslaught of Camaro promotion as GM bombarded the market in an attempt to overtake Ford’s stunningly popular Mustang. The step up to a Z28 optioned Camaro was $358.10 and only available for the coupe. As a special model, the initial sales were not overwhelming. Only 602 were sold. Refinements were made to the 302 engine for the second model year. Some of these upgrades came with the fall ’67 launch of the ’68 Camaros, while others were rolled in production during mid-year. The 302 block was still shared with the 327 and the 350 engines, however it now boasted larger journals and a large journal crankshaft (2.10-inch rod journals and 2.449-inch main journals). First production rods featured pressed pins and larger rod bolts, while second production rods were changed to floating wrist pins. Pistons were also changed in mid-year. First production 302 pistons were similar to 1967 units, however the domes were notched across the entire head of the piston. Cylinder heads and camshaft usage remained unchanged. What the high-winding 302 lacked in low-end torque was made up in thrilling mid – and top-end acceleration. “Above 30 mph,” Car Life noted in a 1968 road test, “on winding mountain roadways, back country lanes and the rest of the types of roads which make driving worth doing, the Z28 Camaro is an exhilarating vehicle. The Z28 engine is a jewel, an outstanding performer by any yardstick.” The word was spreading about the hot Z28 package, and sales rose to 7,199 units for the model year. The package price also rose to $400.25. The biggest news for 1968 was the $500 cross ram package homologated for Trans-Am competition and offered over the counter for the Z28. 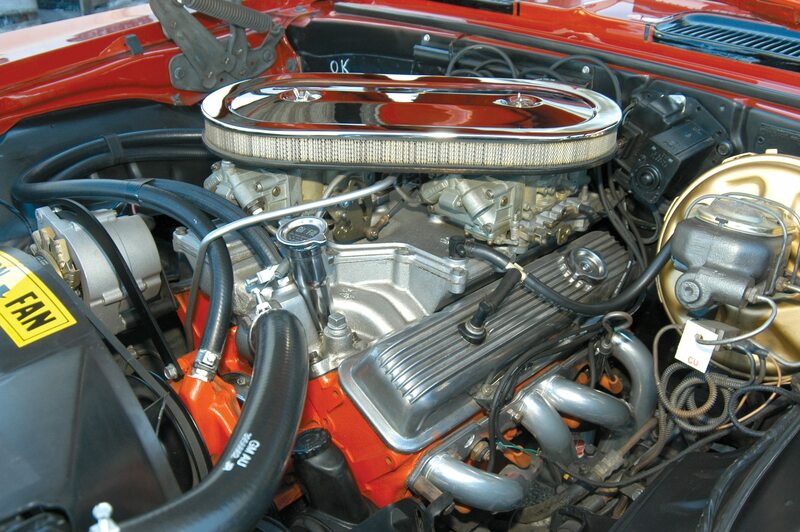 The cross ram had first been conceived in 1966 for use with the big block with the conversion to small block application taking place in the summer of 1967. Actually intended for racing, customers could purchase and install the cross ram themselves for street use (the good old fashioned stop light grand prix) or those less skilled could have the dealer install it for them. Good for at least an additional 25 horsepower, the cross ram started with a special, dual-quad aluminum intake manifold with tuned runners and featured a pair of Holley 600-cfm double pumpers. On the down side, the cross ram lacked manifold heat crossovers or chokes for the carburetors making it difficult to drive on the street. Its true purpose was on the racetrack, where it could pull more horsepower out of the high-winding 302. The cross ram used a cowl induction air cleaner and plenum to take advantage of the cooler, high pressure air located at the base of the windshield. This cool air provided a denser charge and more power. While it was great on the racetrack, most testers found it impractical for street use. “If the Z28 isn’t a bona fide racing car – in street clothing – then we’ve never seen one,” observed Road & Track. The cross ram was available over the counter in December 1967, in time for Chevrolet to homolagate it for 1968 SCCA competition. By the end of the 1967 season, the Penske/Donahue team had sorted out the gremlins in their Z28 and thanks to improvements like the cross ram, won the 1968 Trans-Am championship. 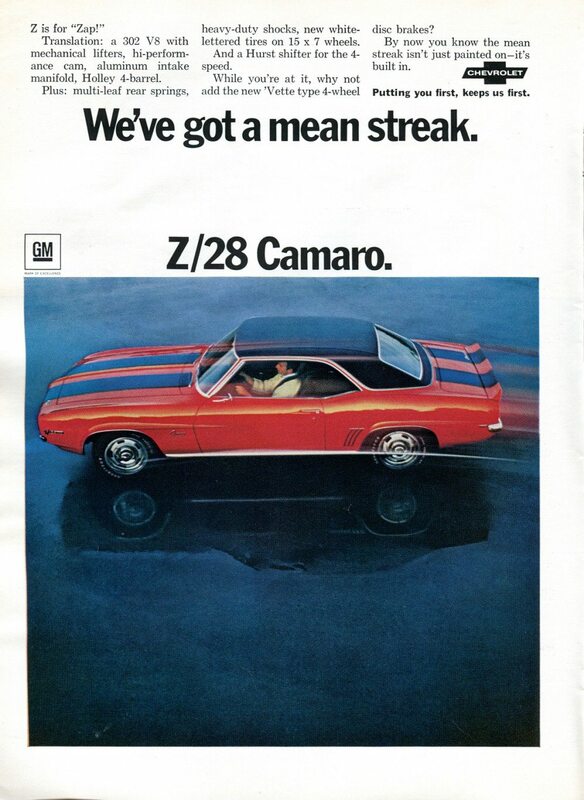 The Z28 truly came into its own in 1969. “News of Roger and Mark’s Trans-Am expedition has finally reached the Chevrolet marketing minions,” noted Sports Car Graphic, “and they’ve caught the fever.” After two years of racing and dozens of magazine road tests, Chevrolet marketing was finally getting behind the Z28 and carrying the word from Detroit to dealers nationwide. The Z28 went through a transition becoming a balanced street performance car, rather than an uncivilized brute wearing painted suspenders. 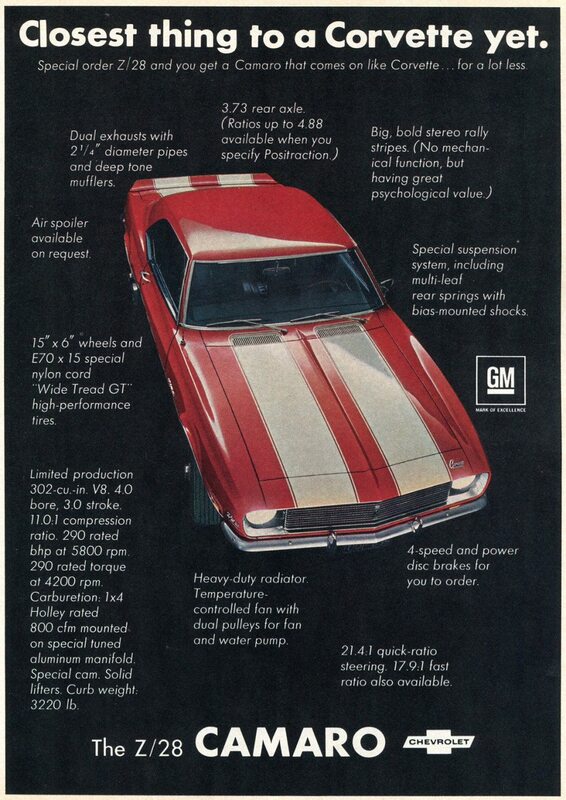 When it came to the 302 engine, the Z28 was not without its detractors. The complaints didn’t stem from the engine’s innate ability to wind to high rpms. Instead, questions rose about the 302’s merits as a street performance engine. Corvette Chief Engineer Zora Arkus Duntov coldly described the 302 “an artificial engine built to meet an artificial class limit.” Within the context of Trans-Am racing, however, the 302 had proven to be a spectacular power plant. On the street, the 302 was cantankerous in cold weather and was undriveable below 3000rpms. The driver had to constantly keep rowing back and forth through the gears to keep the rpms up. For 1969 the Z28 Special Performance Package was basically unchanged from 1968, however, the 302 engine received a few internal improvements. The block now had thicker main bearing webs, four-bolt mains and a large journal crankshaft. The intake manifold was redesigned and the water pump assembly was longer and deeper. While headers (Z282) and plenum air induction (Z284) options had been cancelled during 1968, they were still offered over-the-counter for 1969. Early production 1969 Z28s had the ’68-style deck lid stripes and spoilers. The ’68 production spoilers were slightly shorter than the wider ’69 rear and weren’t replaced by second production units until October 1968. Inside, when a tachometer was ordered, it had a 7000rpm limit and a 6000rpm redline. These were replaced with 8000rpm tachometers, with 6500rpm redlines, during the model year. The D80 rear decklid spoiler and front chin spoiler was now included in the Z28 package. For those who wanted to cruise the boulevard incognito, the wide stripes could be deleted. In mid December, Chevrolet released the RPO ZL2 Special Ducted Hood (known as the “Super Scoop”) as a $79 option. The ZL2 hood, designed by Larry Shinoda, featured a high-rise section in the center that ended with a rearward-facing duct that drew high-pressure air from the cowl into the carburetor through an underhood plenum. The factory ZL2 hoods were stamped steel with special bracings around the round plenum opening that allowed the air cleaner to fit within. The Heavy-Duty Service fiberglass hood was available over the counter for use with the cross ram. It used the same cowl induction technique as the production hood, however the underhood was molded specifically to mate to the foam seal that surrounded the dual carbs. An adapter package was released to use the Heavy-Duty Service hood with the four-barrel setup. It was an instant hit, ordered by 10,026 buyers. Aside from the Corvette, the Camaro and the Z28 were the only American production cars in 1969 to offer four-wheel disc brakes. The Camaro setup (RPO JL8) cost $500.30 and was plagued with OE supplier parts problems. That shortage made delivery difficult and continued to bump the price of the option upward, consequently only 206 sets of four-wheel-discs were installed at the factory when the option was canceled in mid July 1969. A Heavy-Duty Service four-wheel brake package was also offered over the counter. Savvy option manipulators who wanted the strongest setup for racing could order the RPO JL8 brake package on the car and the Heavy-Duty Service four-wheel brake package over the counter and install the Heavy-Duty Service rear axle assembly in place of the JL8’s rear axle. The benefit was to utilize the larger diameter axle shafts and bearings, which were better suited for the rigors of racing. 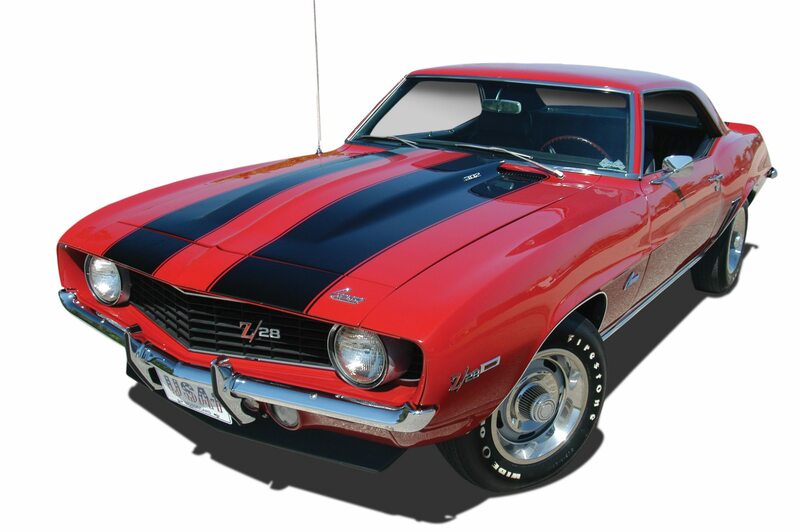 The Z28 reached its zenith in 1969. In Trans-Am racing, the Penske team with Mark Donahue at the wheel trounced Ford to win its second series championship. Chevrolet marketing and sales finally got behind the Z28 for 1969 and raised dealer awareness of this hot ponycar package. 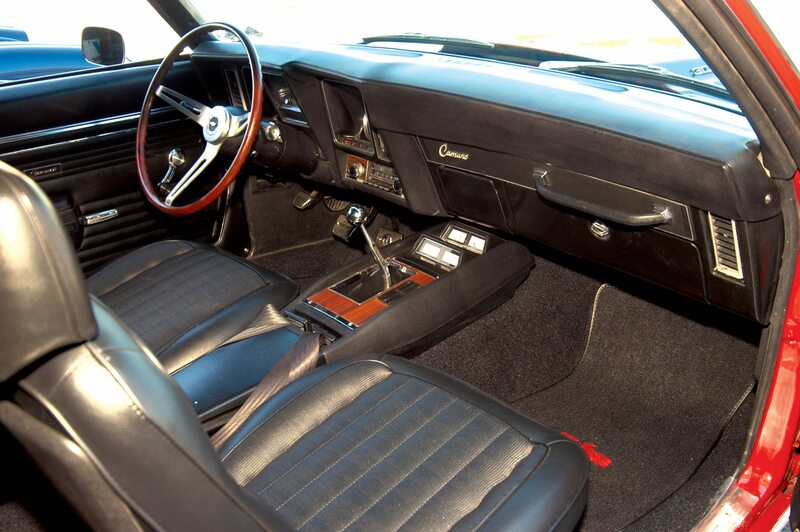 On the street, where a performance car’s reputation could be either made or broken, the Z28 became a favorite and sales reflected this, with 20,302 sold during the extended 1969 sales year. That sales total wasn’t broken until the 1978 Z28 tallied 54,907 units. Chevrolet collector Rick Treworgy in Punta Gorda, Fla., owns the Garnet Red ’69 Z28 featured. It is equipped with the Cross Ram induction system, M22 heavy duty close ratio four-speed gearbox, tube headers, power steering, tilt steering column with wood grained steering wheel and special console instrumentation. Includes 302-inch V8 engine, dual exhaust with deep tone mufflers, special front and rear suspension, rear bumper guards, heavy-duty radiator and temperature-controlled fan, quick ratio steering, 15 x 7 rally wheels, E70 x 15 special white-lettered tires, 3.73:1 ratio axle and special rally stripes on hood and rear deck. Available only when four-speed transmission and power disc brakes are ordered. Positraction rear axle recommended. Includes 302-inch V8 engine with bright accents, chambered dual exhaust system, Z28 emblems on grille, front fender and rear panel, special front and rear suspension, rear bumper guards, heavy-duty radiator and temperature-controlled fan, quick ratio steering, 15 x 7 wheels with trim rings, E70 x 15 special white-lettered blackwall tires, special paint stripes on hood and rear deck. Available only when four-speed transmission and power front or four-wheel disc brakes are ordered. Positraction rear axle recommended. JL-8 (four-wheel discs) recommended. Includes 302-inch V8 engine with bright accents, dual exhaust, Z28 emblems on grille, front fender and rear panel, special front and rear suspension, rear bumper guards, heavy-duty radiator and temperature-controlled fan, quick ratio steering, stripes on 15 x 7 wheels with trim rings, E70 x 15 special white-lettered blackwall tires and special paint on hood and rear deck. Available only when tachometer gauge or special instrumentation, four-speed transmission and power front or four-wheel disc brakes are ordered. Positraction rear axle recommended. JL-8 (four-wheel discs) recommended. Includes 302-inch V8 engine with bright accents, chambered dual exhaust system, Z28 emblems on grille, front fender and rear panel, special front and rear suspension, rear bumper guards, heavy-duty radiator and temperature-controlled fan, quick ratio steering, 15 x 7 wheels with special center caps and trim rings, E70 x 15 special white-lettered blackwall tires, auxiliary front valance panel and rear deck spoiler, plus special paint stripes on hood and rear deck. Available only when four-speed transmission and power front or four-wheel disc brakes are ordered. Positraction rear axle recommended. Includes 302-inch V8 engine with bright accents, dual exhausts with bright tips, Z28 emblems on grille, front fender and rear panel, special front and rear suspension, rear bumper guards, heavy-duty radiator and temperature-controlled fan, quick ratio steering, 15 x 7 wheels with special center caps and trim rings, E70 x 15 special white-lettered blackwall tires, auxiliary front valance panel and rear deck spoiler, plus special paint stripes on hood and rear deck. Available only when tachometer gauge or special instrumentation, four-speed transmission and power front disc brakes are ordered. Positraction rear axle recommended. THE REAL NUMBERS: According to Chevrolet, the 302 produced 290 horsepower @ 5800rpm and 290 lbs.-ft. of torque @ 4200rpm. There’s no question the 302 was underrated, but by how much? Insiders talk about 375 horsepower at 6800 rpm. Road testers could take the 302 to beyond 7,000rpm and the engine was still pulling. Keeping the horsepower rating low kept the insurance premiums down for youthful drivers and was a transparent foil for SCCA specifications. BETTER BRAKES: Thanks to the research and data collected with Donahue’s race car, Chevrolet engineers developed a four-wheel disc package that became available in March of 1968 as a “Heavy-Duty Service Package” to conform to SCCA/FIA rules. This over the counter service option was primarily geared for racers but was suitable for dealer or customer installation. SUPERIOR SPOILER STUDY: During the 1968 season, the Penske crew was invited to bring their Camaro race car back to Detroit for a vehicle dynamics analysis by Chevrolet Engineering. While the race car was at GM’s Milford, Mich. test facility, Chevrolet Engineering gathered new data on spoiler position and angles for application on the 1969 Z28. If you have a Chevrolet Camaro or another collectible you’d like to insure with us, let us show you how we are more than just another collector vehicle insurance company. We want to protect your passion! Click below for an online quote, or give us a call at 800.678.5173.